Home Costs > How Much Does Borax Cost? How Much Does Borax Cost? Borax, also known as a sodium borate or disodium tetraborate, is a boron compound that has the consistency of a white powder. This white powder dissolves in water and has a wide variety of uses, including being used for a laundry detergent, anti-fungal compound, a texturing agent in cooking and even in cosmetics. Many recipes found online are often for cleaners to soften hard water, create a homemade laundry detergent soap or even used as a pesticide to get rid of common pests such as roaches. On average, borax is going to range anywhere from $2 to as much as $5 for a 55-ounce box. The cost of borax is going to depend on the brand, size and its use. Most of the time, you shouldn’t have to spend more than $3 per box. For example, at Walmart and Target a six-pound package of borax detergent booster retails for $4. Aside from the powder form, borax can also come in tablet form. These tablets, designed to keep the inside of a washing machine clean, can cost around $8 to $12 for about three to five tablets. A borax flux, which is usually used with machinery and sewing, can vary anywhere from $7 to $10 per pound. Borax hand soap, which is very similar to the soap you use in the bathroom and kitchen, can cost anywhere from $6 to $12 for a five-pound box. According to TheFamilyHomestead.com, a 76-ounce box will usually cost around $3. For those who are making their own laundry detergent, plan on spending around $0.14 per batch. 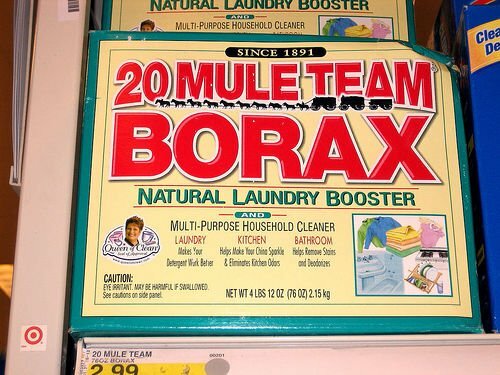 Borax, when purchased online and in store, will almost always be the “20 Mule Team” brand. This brand is sold in a white box with red lettering and a pinch of green. Borax will be found at almost all grocery stores in the laundry detergent aisle. It can also be found at hardware stores, farm supply stores, international grocery stores and even local swimming pool supply stores. Laundry detergent will often come in a five-pound box, while hand soaps will generally come in 12 or 16-ounce containers. Due to its powder form, borax often works better in a stainless steel dispenser that is designed for it. These dispensers can cost anywhere from $30 to $80. If you are making your own detergent or soap, you may need to add extra ingredients into the borax. For instance, you could add fragrance to the mix to give the soap a clean fresh scent. Borax is a great way to help eliminate all sorts of odors and even help remove stains that are very hard to get rid of. If you are a budget-savvy person, borax is a great alternative for any name brand laundry detergent, and studies have shown that borax can actually work better than some name brands that are out there. Borax is great for more than just cleaning clothes and various body parts. In fact, it can also be a great deterrent to keep fleas out of the home. According to Three-Little-Pitties.com, borax can keep fleas out of a home for up to a year. While it is a “natural” ingredient, The Balance says it should be kept out of reach by children and pets since it can be toxic. If you do, by chance, plan on using it inside your home, be sure to label everything accordingly. With popular brands, such as Arm and Hammer, you can often find that there are hundreds of coupons available on the internet. Check the internet, your local paper or social media channels to see if there are any coupons you can take advantage of. Buying in bulk at local wholesale clubs can often be cheaper than buying individual boxes at local retailers. I bought this borax to make slime. And y’all estimated correctly. Thanks you! !